This document sets out guidance, against the background of the National Planning Policy Framework (NPPF) and the related guidance given in the Planning Practice Guide (PPG), on managing change within the settings of heritage assets, including archaeological remains and historic buildings, sites, areas, and landscapes. 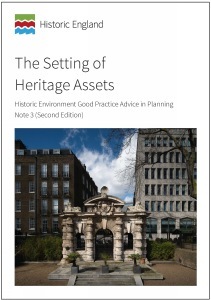 It gives general advice on understanding setting, and how it may contribute to the significance of heritage assets and allow that significance to be appreciated, as well as advice on how views contribute to setting. The suggested staged approach to taking decisions on setting can also be used to assess the contribution of views to the significance of heritage assets. The guidance has been written for local planning authorities and those proposing change to heritage assets. It replaces The Setting of Heritage Assets: Historic Environment Good Practice Advice in Planning Note 3 – 1st edition, (2015) and Seeing the History in the View: A Method for assessing Heritage Significance within Views (English Heritage, 2011).